The most famous episode in franchise history, "The Trouble with Tribbles," is one of the highlights of the second season of Star Trek: The Original Series. A deserved classic, the humorous story centers on an ever-expanding mass of furry creatures that memorably rain themselves down on top of Captain Kirk (William Shatner) and into the middle of a Federation-Klingon showdown. It inspired one of the most memorable episodes in the spin-off series Deep Space Nine, "Trial and Tribble-ations." Also in the second season, the Vulcan culture of Mr. Spock (Leonard Nimoy) is fleshed out in "Amok Time" (in which Spock is faced with the possibility of killing his captain and friend) and "Journey to Babel" (introducing Spock's father, played by Mark Sarek, in what would turn out to be a long-recurring role). A new character, navigator Pavel Chekov (Walter Koenig), was introduced; his Monkees haircut was intended to appeal to the younger audience, but he was also a Russian, which at the height of the cold war reflected Gene Roddenberry's optimistic vision of a more enlightened future. Other social-commentary opportunities presented themselves in "The Omega Glory," "The Doomsday Machine," and "Assignment: Earth," the last also one of those periodic opportunities to scrimp on the budget by time-traveling to an earlier version of Earth. Another example was "A Piece of the Action," a comic episode set in the Roaring Twenties and memorable for, among other things, Kirk's teaching a made-up card game called Fizzbin. In other significant episodes, "I, Mudd" saw the return of the bounder from season 1, "The Changeling" was the original inspiration for the first Trek feature film a decade later, "Wolf in the Fold" (penned by the author of Psycho) provides an example of the series' great writing, and "Mirror, Mirror" introduced the concept of the parallel universe inhabited by vicious, amoral counterparts of the regular crew, another theme later borrowed (more than once, and to good emotional effect) by DS9. 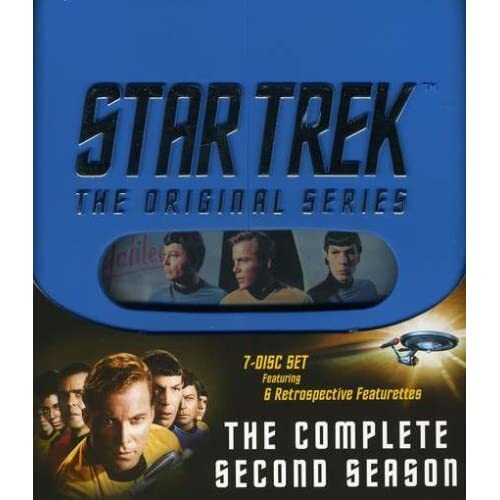 Special features are a bit lighter than on the season 1 set, but they do feature such contributors as Shatner, Nimoy, George Takei (Sulu), Koenig, Nichelle Nichols (Uhura), and editor-writer D.C. Fontana. Of chief interest are "To Boldly Go," a 20-minute season recap; " Kirk, Spock & Bones: The Great Trio," discussing the interplay among Kirk, Spock, and Dr. McCoy (DeForest Kelley); "Star Trek's Divine Diva," shining the spotlight on the development of Nichols's character (she was originally considered to play Spock); and "Writer's Notebook: D.C. Fontana," discussing her various roles in the series (she used her initials to avoid the anti-female bias in science fiction at the time).